The Lynx Fast Life campaign I worked on at Visual Jazz had a design style that was just screaming for more than just the usual blurs and fades you usually use on a flash website. Something that looked more like After Effects then flash. After a bit of messing around with prototypes I finally came up with something I thought looked pretty cool and it ended up getting used throughout the entire site. The effect was created by taking in a BitmapData of the text I wanted to reveal and then building around that. First of all, I created two larger versions of the original BitmapData with extra transparency around them. Then I added a GlowFilter to thicken them up a bit before applying a two different levels of BlurFilter to the BitmapDatas. Next, I lined these up with the original BitmapData and used them as masks for a gradient filled shape I generated (everything was set to cacheAsBitmap so I could do alpha masking). I animated the gradient through the blurred masks with a slight delay between them – this gave an effect of a tapering off type of brightness. After that I created a gradient filled mask for the original BitmapData which I used to reveal the base image behind the two blurred glows. I had to play around with the timings a bit, but eventually came up with some values I thought worked pretty well. Finally, just for a touch of class, I added in another small gradient to act as a shine to the text. It used an instance of the the original BitmapData as a mask and simple past over the length of the text a second or so behind the reveal. And that was that – my pretty cool glowing text reveal effect thingy. For the transition out of the text I did something a bit different. I wanted the text to decay away, but I didn’t really have a lot of time to get the effect right. What I came up with was a bit of a Frankenstein approach that generated an interesting result. I started by creating a bit of a mask/guide in an off-stage Sprite. It consisted of a BitmapData generated from Perlin Noise as a base, and a gradient-filled shape that was big enough to cover the perlin noise base. I then set up another BitmapData as a mask for the original text. Here comes the fun part. I animated the gradient mask in my guide sprite to slowly slide across the perlin noise. As I was doing this, I did a BitmapData.draw() of the mask/guide into the BitmapData mask of the text, using BlendMode.MULTIPLY as the blend mode. This caused the the areas of the perlin noise that were revealed by the gradient to build up in the mask, hence slowly hiding chunks of the original text. I hope that makes sense – I am pretty tired as I write this. 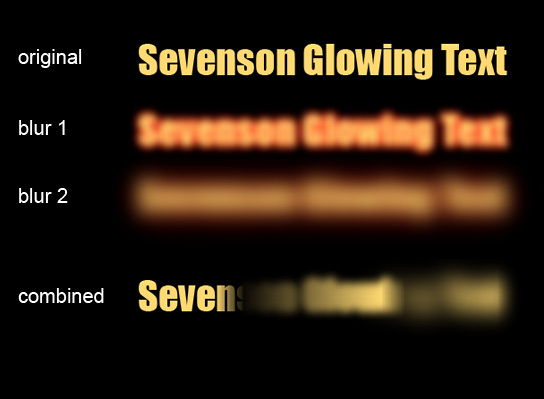 * Creates a new instance of the GlowingText class. * A clean up routine that destroys all external references to prepare the class for garbage collection.